Sci-fi artwork which may or may not be related to the Steel Beneath the Skin novels. 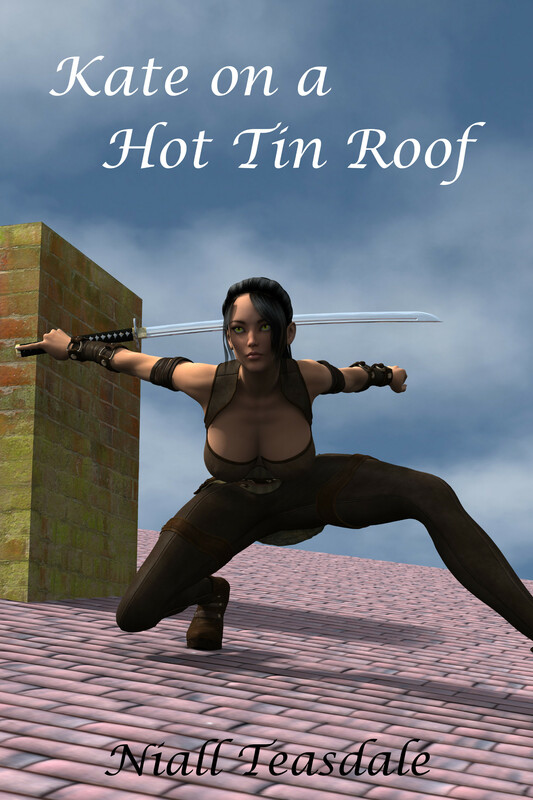 Possibly not my best cover, but Kate on a Hot Tin Roof, the first of the Unobtainium series, is out and available. Yes, that’s Kate. Yes, the roof is tiled. So, the road to audio continues. At the weekend I was sent the first 15 minutes of the audiobook of Steel Beneath the Skin to approve. I approved. It’s just… strange. I listen to audiobooks a fair bit and this is someone reading my writing to me. I think it’s going to be good, but I may be prejudiced. I also put the cover up on ACX, and DeviantArt. It re-rendered it because audiobook covers are square. You get a bit more leg than on the ebook and paperback. I won’t repost the picture, but you’ll find the big version here. As an aside, Kate On A Hot Tin Roof, the first of the Unobtainium series, is in proofing. Expect that to hit the stands very soon. Looks like the back cover of a book, right? That’s because it is! Yes, Steel Beneath the Skin is in print (well, sort of; print on demand, so it’ll be in print when someone demands one). So here we are with the cover art for The Lowest Depths of Shame. This week has kind of sucked. I have this playlist full of overly happy songs and I’ve had to play it almost once a day this week to stop me murdering people. That’s the kind of week this has been. Putting Shame out is going to be the highlight of the week. For no other reason than that it looks cool.